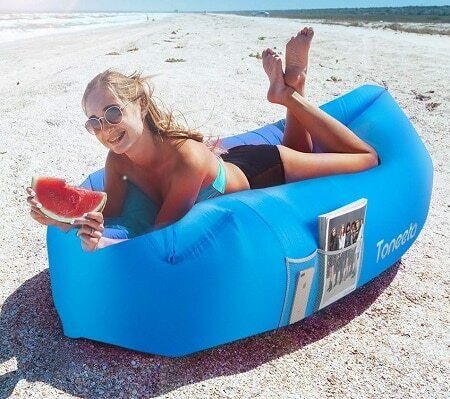 Highly-Rated Inflatable Lounger Air Sofa – 50% Off when you use the code D8FRJYG3 at checkout! Convenient design, no pump required, whisking the air into the sofa or swing to catch the air for saving your strength. Great for the outdoor survival trip without extra unnecessary item. It is not a flat sofa. Features with a unique pillow shaped, even you are travelling outdoor or sleeping in your yard, you will also need to a comfort soft condition to help you relax. With our air sofa, you can do that at anytime anywhere. Ultra durable 210T prevent tearing nylon material, Easily support around 260lb heavy body, equivalent to 2 girls and 1 strong musclar man. No air leaking design with double layer fabric, long lasting inflation for around 5-6 hours. Offering you the most comfortable using experience. Package included carry bag and stake, no need to worry about windy day and you can also enjoy the the wind brings you the cool. Additionally with the carry bag, you can fold it and take it everywhere you want to be.